Esteban Ocon finds himself in great demand from two teams - Renault and Mercedes. Initially in the Lotus young driver programme, Ocon joined the Mercedes development programme instead. From a combination of both links, he has experience as a test driver for Renault, Mercedes and Force India, half a season of racing at Manor and a deal for 2017 with the Force India team for a full season of racing. Ocon started his motorsport career with the traditional karting championships, winning in France before taking on more international competitions. He moved into single seater racing in 2012, participating in the Formula Renault series, in several of its variations. He was a strong contender, finshing on the podium in his first season, and adding more trophies as he continued. In 2014, Ocon moved to the Formula Three series, winning the championship at his first attempt. He also participated in a handful of Renault 3.5 events and impressed in those as well. As part of the Lotus young driver initiative, Ocon was given the chance to test with the F1 team, and drove in Friday practice at Abu Dhabi in the last round of the 2014 season. He also drove alongside fellow countryman Romain Grosjean in the Race of Champions at the end of the year. For the 2015 motorsport year, Ocon participated in the GP3 series for ART, winning the championship at his first attempt. He was also a test driver for the Force India F1 team, and switched to the Mercedes young driver programme rather than sticking with the Lotus outfit. 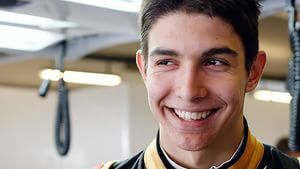 However, when Renault rebranded ahead of the 2016 season, they wanted their French driver back and Mercedes agreed to loan Esteban Ocon back to the Enstone squad as reserve driver. Out of the blue, midway through the 2016 season, Esteban got the call to join the Manor squad, replacing the outgoing Rio Haryanto. Rio had run out of funding, and Manor's engine supply deal with Mercedes meant the German team were able to find a race seat for their young driver. Ocon completed nine races with Manor, outperforming his highly rated teammate Pascal Wehrlein. Ahead of the 2017 season, it was confirmed that Ocon would join Force India for a full season of racing, again beating Pascal Wehrlein to the seat he had been considered for. Three seconds up the road, Esteban Ocon is no doubt getting the news that Vettel will be approaching very soon. Esteban Ocon comes in for his one pit stop, yellow tyres going on the leading Force India. He rejoins in fifth place. Esteban Ocon and Fernando Alonso pit at the same time, Daniel Ricciardo moves up to sixth in the blink of an eye. Verstappen's next victim is Esteban Ocon, who looked to defend the position but ultimately allowed the Red Bull throughout relatively easily. Max now has to close down eight seconds to find Räikkönen. Esteban Ocon has made his way up to fifth place, deposing Kimi Räikkönen. Esteban Ocon puts his foot down and powers past Magnussen, who has lost two places in one lap. Ocon moves to 11th place, and has a two second gap to close to the other Haas. Distracted, Magnussen drifted back into the clutches of Massa, but then remained ahead - though Esteban Ocon took the initiative and moved ahead of the Williams as well. Lots of squeezing happening, with the walls looking closer than ever. The battle is back on between Lance Stroll and Esteban Ocon, with the Force India having to display some solid defensive moves. Kimi Räikkönen takes an aggressive line to pass Esteban Ocon for sixth place. Ocon looks for the outside line at the next corner, but has to drop behind. Esteban Ocon attempts to put a car between him and Räikkönen by overtaking Vandoorne, but the Ferrari sweeps through as well. There's 15 seconds or so ahead of Ocon now, but the next car is teammate Sergio Pérez - and we know how well that always works out.